Erythrasma is an erythematous, scaley rash similar in appearance to tinea. It can be located in the genital area, axilla, inter-digital spaces of foot. Caused by cornebacterium a gram positive organism. Treated with erythromycin, clindamycin gel, or even better a topical azole anti-fungal. Since it would probably be hard to distinguish in the ED from tinea it is good it can be treated with an antifungal topicaly. It is a non-ulcerative rash. It has a coral red appearance when examined with a woods lamp (blue light). Ulcerative STD’s include syphilis, LGV, herpes, chancroid. Hytidaform mole is associated with first or second trimester bleeding. Snow storm appearance on ultrasound. Unusually high HCG levels. Patients will have severe nausea and vomiting. There is potential for malignancy. Treatment is D & C.
Ecclampsia is defined by seizures or coma in a pre-ecclamptic patient. Treat with magnesium. There was a discussion about the risks of giving methotrexate in the ED. General consensus is that an attending OB physician should be the person signing the methotrexate order. 10 rads is the threshold for human teratogenesis. Most of the common ED imaging studies are well below this level of radiation. Risk of heterotopic pregnancy in a patient who underwent IVF is 1%. Kelly comment: any fertility enhancement therapies increase the rate of heterototpic pregnancy. Baseline rate of heterotopic pregnancy in non-fertility enhanced patients is 1 in 4000 or 0.025%. In setting of threatened AB, risk of miscarriage drops to 5% if fetal heart activity is identified on ultrasound. PID causes infertility in 12% of patients. So with that rate it is considered prudent to treat presumptively in the ED. Over-treatment is acceptable. Mila comment: If you are reaching for a swab to test for GC/Chlamydia, you should strongly consider treating the patient. Most vaccines are ok in pregnancy (TDAP, Influenza, Hep B). Chicken pox vaccine is not. Any other live vaccines are not ok as well. Avoid NSAIDs in pregnancy as it reduces uterine blood supply. Narcotics are ok in pregnancy except if delivery is imminent as it will suppress fetal respirations. Use plain local anesthetics without epinephrine to avoid small potential of epinephrine affecting placental blood flow. Kleihauer Betke test and flow cytometry are 2 tests to identify larger/massive fetomaternal hemorrhage. If positive in the pregnant patient with trauma, they will need a 300mcg dose of rhogam and possibly additional rhogam. Clue cells are vaginal epithelial cells covered with bacteria. This indicates bacterial vaginosis. Treat with metronidazole 2 grams single dose. Bacterial vaginosis (BV) represents a complex change in the vaginal flora characterized by a reduction in concentration of the normally dominant hydrogen-peroxide producing lactobacilli and an increase in concentration of other organisms, especially anaerobic gram negative rods [6-9]. The major bacteria detected are Gardnerella vaginalis, Prevotella species, Porphyromonas species, Bacteroides species, Peptostreptococcus species, Mycoplasma hominis, Ureaplasma urealyticum, and Mobiluncus species . Fusobacterium species and Atopobium vaginae are also common. 45 yo female with multiple GSW’s. Airway is intact. Wounds in right anterior hip, left medial gluteus and left lateral hip regions. Abdomen is soft with mild RLQ tenderness. Pt also had epigastric tenderness. Vitals were not hypotensive. Plain xray shows 2 bullets. 1 bullet in right pelvis and 1 bullet in epigastrium. Harwood comment: In trauma there is a calculation, Holes + Bullets = An even number. If not, you have to look for another bullet. Exceptions: Bullet from a previous trauma or an embolized bullet. In this case we have 3 wounds and 2 bullets=5. Not an even number. Erin stated that the patient did have a bullet in her leg which accounted for the third bullet. Traditional teaching was that laparotomy was indicated for any GSW to abdomen. More recently, it is thought that the overall morbidity from negative exploratory laparotomies outweighs the benefit of this strategy. New strategy is to use triple contrast CT in stable patients without peritonitis or free air on xray to identify cases requiring surgery. Intrpretation of CT in this case was made that likely there was no peritoneal violation. Patient was to be observed and re-evaluated. Repeat exam in the ED shows non-tender abdomen and stable vitals. Later that day patient is eating. That night heart rate increases to 138 but comes down with pain medications. Next day urine output drops. Heart rate increased again that morning. Later that morning, patient suddenly coded. Patient was resuscitated and transferred to SICU. Patient had rigid abdomen and found to have septic shock. Patient went to OR and was found to have blast effect injury to bowel causing a single perforation. Patient later developed gangrenous bowel and needed bowel resection. Patient was discharged after 30 days in hospital. Risk/Benefit to conservative management of GSW to the abdomen using CT evaluation is that other studies have shown that even 8 hours delay of identifying bowel injury increases morbidity and mortality. Patients being evaluated with this non-operative conservative management approach need frequent re-exams of their abdomen and overall clinical picture to promptly identify any need for surgery. wounds: When is it safe to discharge? determine the safe period of observation before discharge. a trial of NOM were prospectively enrolled (January 2009 to January 2011). defined as the need for operation. a trial of NOM (47 had equivocal CT findings and 44 had a negative examination). minutes). All patients failed within 24 hours of admission. Our ED culture does pretty good with wearing gloves as PPE. We do less well with wearing masks and gowns. This is similar to what the literature reports at other large trauma centers. We have had approximately 51 sharps and 17 splash reports for the hospital over the last year or so. The ED and Surgery residents have the highest rates of sharps injuries. Through 2010 there have been 57 documented and 143 suspected HIV transmissions due to body fluid exposure for healthcare workers. There is a 1.8% risk of HCV transmission with needle stick injury. You should wear a face shield, gloves, and gown when there is a reasonable risk of body fluid exposure. Basically when you walk into a trauma resuscitation, you should be using these protective devices. Why do healthcare workers not routinely use PPE? Lack of availability, lack of convenience, lack of cues to risk of body fluid exposure, concerns about how patient and family members will perceive the doctor wearing PPE. Things that encourage use of PPE: having a personal incident of significant body fluid exposure, cultural shift of the department. Easiest fix seems to be to make access to PPE more convenient in the ED. It would be optimal to have stocked PPE stations in easily accessible places throughout the ED. This is a common and deadly disease. The mortality of sepsis is much higher than for an acute STEMI. (16% sepsis, 20%severe sepsis, 46% septic shock, 10% STEMI, 30% massive PE). This disease is treatable and mortality trends have been improving. *SIRS Criteria Only about 20% of patients with SIRS have an infection. 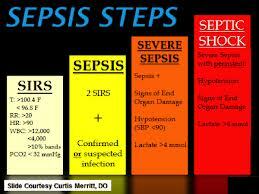 Sepsis is infection with systemic manifestations. Severe sepsis is infection with organ dysfunction. Septic shock is infection with hypotension refractory to fluids or Lactate >4. 4 Management priorities: recognize sepsis, broad spectrum antibiotics, resuscitation, and source control. Tachypnea is an important clue to sepsis. Be vigilent for intra-abdominal infections. Send lactates early and often. Don’t delay empiric antibiotics for diagnostic results. Elise comment: Lactates from VBG’s are more accurate than the ones from the lab. Time to running the test in the lab is probably a big reason for higher (inaccurate) lactates from the lab. Robbie comment: At South Sub, point of care lactates are available. Antibiotics should be administered within one hour. 7% increase in mortality for every hour of delay. Source control is frequently overlooked. Remove indwelling urinary or vascular catheters. Surgically treat nectrotizing infections, gangrenous organs, and pus collections. Source control should be obtained within 12 hours. By the book, patients with septic shock from C-diff should be considered for hemi-colectomy. Harwood comment: I always get a surgical consult in these patients. If they don’t rapidly improve they should get surgery for hemi-colectomy. EGDT by Rivers shows 17% decrease of in-hospital mortality and 50% decrease in sudden CV collapse. Process Trial showed we no longer need protocolized care. After a decade of learning the basic tenants of EGDT standard non-protocolized therapy does just as well as a protocol. Aggressive early fluid management is a cornerstone of management. 30ml/ Kg should be your initial bolus. Erik Kulstad said that LR should be the fluid of choice for sepsis resuscitation. To evaluate further for fluid responsive shock, passive leg raising and watching for a BP elevation within 5 -10 minutes is very specific for fluid responsive hypotension. Norepinepherine is first line pressor. Epinepherine is second line pressor. Give steroids if pressors are not working. Transfuse at a hemoglobin of 7. Elise comment: I still think sepsis protocols are useful for docs that are either early in their careers or don’t manage sepsis routinely. Procalcitonin has no real utility in the ED. It is more useful a few days out. In a patient who has been in the hospital for 2 days with no clear source who is improving and procalcitonin is normal, it is ok to stop antibiotics.